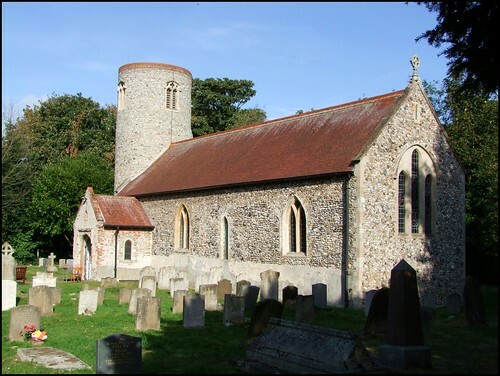 This pretty little round-towered church is tucked away in the pleasantly domestic northern suburbs of Lowestoft, and has been for years. The parish name is just a courtesy title really, and there probably never was a village centre, for this was the Hall church. The Hall itself is now a holiday village, and the former grounds the home of the Pleasurewood Hills American theme park, East Anglia's biggest single tourist attraction. To really appreciate the historic setting of this church, you could do worse than leave your car in their car park. You can then walk the quarter of a mile along the footpath through the woods to the church. Despite the urban setting, St Peter is a truly rural church, with a pretty round tower, and magnificent Norman north and south doorways. The body of the church was pretty well completely rebuilt in the 1890s, although something of its earlier medieval integrity has been preserved. Now, however, the chancel and nave run under a single roof, and there is no chancel arch anymore. The people of the parish probably think that no one is interested in seeing inside, because ordinarily they keep this church locked, without a keyholder notice. This is a sad reflection on the people of Lowestoft, because in a county where virtually all medieval churches are open every day, or at least accessible with a nearby key, the churches of Lowestoft still lock us all out. I have no doubt that this makes them prey to vandalism, because, as the Churchwatch charity have pointed out, churches which are kept locked all of the time are far more likely to be vandalised than those which are regularly open, they are twice as likely to be broken into, and are even slightly more likely to have something stolen from them. The irony is, of course, that if parishes like this suffer such a loss it tends to make them even less likely to keep the church open, and so the spiral of decline continues. However, if you can, you step into a pleasantly neat and trim late 19th century interior, albeit rather gloomy from the tinted glass. The building is obviously still well-used and cared for. At the east end, the rather awkward late Victorian triple lancet window contains panels of simple 1960s glass depicting Christ and the parable figures of a fisherman, a sower and a reaper, a nice reference to the main occupations of this part of Suffolk, even if the design itself is not particularly exciting. More pleasing is the view back to the west, down the church to the tower, with good late Victorian furnishings set in a sea of shiny tiles.